Our aim has always been to make old traditional open pollinated seed commonly available to home gardeners. 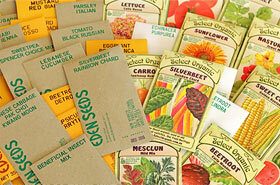 To this end we have made Eden Seeds and Select Organic seeds available through hundreds of retail outlets. Our mail order service is second to none and ordering by internet is “easiest by far”. We have also tried to keep prices at a low sustainable level and provide best storage practices for best germination results. We now have the widest range of seeds and widest bulk seed range including Sweet Corn as low as $34 per kg for commercial growers. We therefore support home gardeners to “grow your own” - a most rewarding activity for all the family.